This seatmap is being used for all flights will an sUA 777-200ER scheduled. It is being used to guard against equipment swaps into one of the three possible seating configurations: legacy sUA 3-class (8F/40J and 3-3-3 in Y), 2-class Polaris (50J and 3-4-3Y), and 3-class Polaris/PE (50J/24W and 3-4-3 Y). The actual seatmap for the aircraft assigned to your flight will become available when the flight is added to the normal Flight Status display, approximately 60 hours before departure (usually overnight). Blocks in Economy are at all 'F' seats, plus 20CH, 21BJ, 22BJ, and 35ABCDE (the last for accommodation). The blocks are designed so that, regardless of which equipment flies, no one will be moved or scrambled when the seatmap updates. Instead, some seats will unblock and some blocked seats may be deleted based on the real configuration, and then some rows may be added. This process is similar to that for the 757-300, 737-900, and other frames with uncertain configurations. Some danger remains if there are more equipment swaps after the initial frame assignment, and the change from F/J to Polaris in the forward cabins is not a well-defined mapping. Similarly, as Premium Plus is added to the existing Polaris 773s, Rows 19/20/21 seats B & K are not shown, to accommodate potential swaps between PP & non-PP equipped aircraft. It is speculated that once PP is offered as a true separate cabin. UA will focus the PP equipped aircraft on a few selected routes to minimize the swap risk. Yes, provided you pay the change fee ($0-$125, depending upon status), increased Air Passenger Duty, and the extra miles. And, yes, there's always a chance it will change back. That's likely to be the reality of traveling United over the next couple of years as they upgrade the fleet. Thanks. It looks like a $50 change fee because I am Platinum. I did not realize there would also be additional taxes. Is there a window where one can be sure as to the type of aircraft that will be used? I can wait, although I guess the availability may not be there is people are waiting on GPUs to clear. Yes, $50 for Platinum. The difference in Air Passenger Duty is £75. (Travel in Y is £75 for flights over 2000 miles; travel in J/F is £150. Travel on a private jet, OTOH, is £450, so it could be worse. You can't be sure of what kind of plane will be used until you land in San Francisco. Even if it's Polaris when you board, you never know when an emergency might result in a diversion. A more helpful answer would be that you're likely to have a pretty good idea sometime the previous evening, when the plane that's supposed to make the 9:30 departure leaves from the US. (Currently, that plane is coming from IAD, but that's subject to change). Use the "Where is this plane coming from" feature. 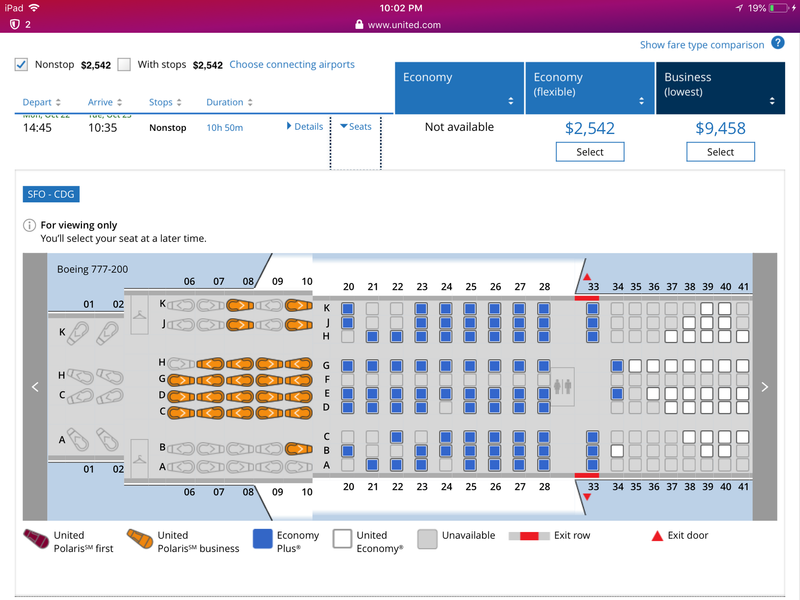 Once the plane takes off from the US, if it has the Polaris seatmap, there's a pretty good chance that it'll keep it, and then you're just hoping that they don't reassign the planes overnight. I ended up doing a SDC to the earlier flight and got a Premium Economy seat! btw, the Polaris on the 777-200 doesn't look as nice as it does on the 777-300ER. I know the seats are the same but the smaller size of the plane just threw me off. Also, the fact that there is just the one galley in the middle and not the crosswalk thing makes it all more croded. I like 9L on 777-300ER but would not choose it on the 777-200 because it is closer to the galley. Anyone got the scuttlebutt on the bulkhead seats behind the PE seats? How much legroom is there compared to row 20 on the non-PE planes? Flying to FRA next week, and per the future flight status tool, looks like aircraft assigned at the moment is a Polaris/PE bird. We're currently seated in 24 ABC, 3 pax (2 silver, if it matters) + a lap infant. The middle section of rows 20 and 21 appear to be empty at the moment. Load in E+ is pretty light at the moment - I'm counting 14 seats selected (though I realize there may be more without selected seats yet. Flight is Xmas day, so not surprising to see this, and I suspect a fairly light Premier load here. - If we're looking to score a set of PE seats, any thoughts on the best way to do this proactively? Do we move to row 20 now, before the seat map switches over, or does it even matter since seating seemingly, based on thread reports, seems to get scrambled anyway during the switch (I presume that could happen even where we are now)? Or should we wait until the switch happens, and then see if we can move to whatever is available at that point. 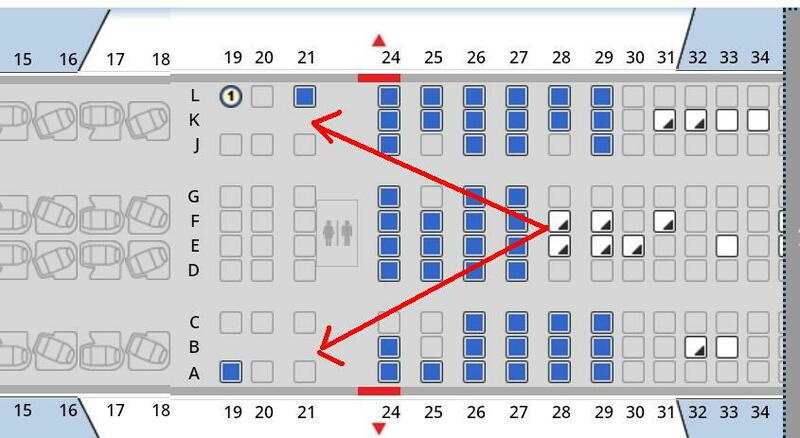 - Anyone know if there is bassinet availability in this section, presumably would be in row 20? Not mandatory (we aren't in a bassinet row, currently, obviously), but might be helpful, so ideal if that was an option. Is there even a bulkhead wall in front of row 20? So an update to my last post above. Decided to wait until the updated seat map posted, which happened overnight last night. Not sure exactly when, but sometime at around 2:30 am eastern time. Silvers here. Originally, we were in row 24, and were moved to row 32, so regular E+ seats. Checked the seat map to see how much the premium plus seats would be vs. the regular E+ seats. This is where I got a shocker. So it allowed me to select the available seats in rows 20-22 for free. But other E+ seats in row 30 and beyond were charging the various amounts (I think $124 for an aisle). So not sure if there is a reason it was letting me switch to the Premium Plus seats without fee - moved on the app, and checked on website, and both were doing the same thing. I wonder if it is accommodation for this specific PNR (we were given E+ seats free of charge by an agent - at her insistence, I didn't ask - because it took an hour and a half to get this reservation properly sorted (it kept trying to kick me off the LH segment)). But then I'm thinking that can't be it...why would it allow the PP seats for free, but not the regular E+. Whatever happened, as long as nothing changes, I'm happy. 3 of us (plus lap infant) are in 20 EFG, with no one in D at the moment, though flight is listed as 'full', so I suspect we will have a neighbor onboard. On this particular flight, only about half the PP seats are taken at the moment, but we're light in E+ because of the holiday. Of another note, seems like the Polaris seat assignments mainly put folks in the seats in the middle section. Not sure if its because there are a lot of couple PNRs, or something, but there are 33 seats taken, and all of the center rows filled, with only single seats on the sides remaining. And another update: Now back to a non-PP bird. They put us in 19 DFG. Sigh. Was hoping to check out PP. So still hoping for another switch...we'll see. This is a tangentially related question but I was able to select what I think was an aisle PP seat for an upcoming flight at check in. The reason I believe so is that there was a 2-4-2 layout in the cabin which seems to correspond to a PP seat. However, my emailed boarding pass states that I have a middle seat. Am I not understanding something? Thanks! I think it may be due that the IT assigns the label middle seat to all seats that have the same letter as other middle seats in one class of cabin. If you have 20B or 20K it would call that a middle seat as in Row 31, 31B or 31K would be middle seats. I guess that should change when it will considered a different cabin (Premium Plus). If you look at the seat map and your assigned seat is still the one you chose in that plane type, I would not worry what the label is. I would worry if they change the plane type. It looks like for now my plane type still contains Premium Plus and my seat matches. Fingers crossed that it stays that way although I will be checking periodically in case it changes. Why are these TPAC 777-300ER seat maps missing middle seats? An seatmap for converted aircraft with Premium Plus / Premium Economy seats (before they are sold as a separate cabin). Sold for now as regular E+. I picked seat 19L(window) for both the outbound and return flights. Does that mean I'll be sitting in the new seats? Perhaps but aircraft swaps (to without PP) are common -- only a minority of 773s presently have PP. This seatmap does not promise PP, but rather protects UA from overbooking if the PP aircraft is used.